Here’s another funny picture of a sign we saw in India. This one is from a Pizza Hut in Jaipur. 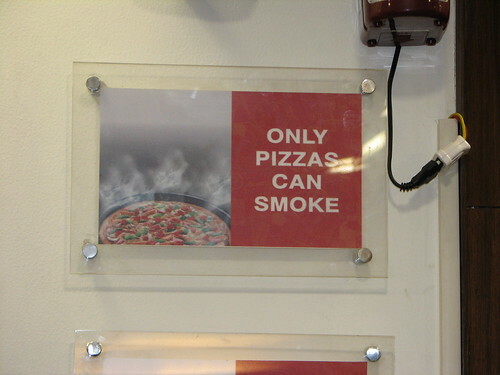 The sign reads “Only pizzas can smoke”. LOL! This entry was posted on Friday, January 16th, 2009 at 5:39 am CET and is filed under Foto Friday, Funny	with tags . You can follow any responses to this entry through the RSS 2.0 feed. You can leave a response, or trackback from your own site.